Santorini – one of the most picturesque and photographed of all the Greek islands – is a magical display of the beauty of our world! Although the main town of Fira with it’s cliffside village and caldera views is spectacular, we found the quaint, colorful streets and breathtaking views of Oia to be a Greek dream come true and a photographer’s paradise found! 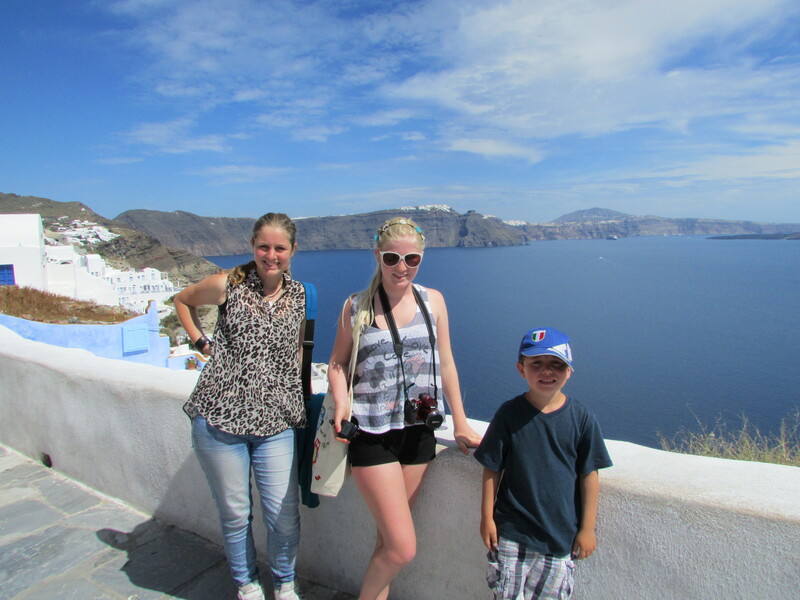 The trek to Oia from Fira is a teeth-clenching, curvy, 20-minute drive along winding cliff side roads with amazing views over the east side of the island. Although the drive is a bit unnerving, the magic of Oia will erase any remaining stress and leave you entranced by it’s beauty and tranquility. The quaint shops and cafes are nestled along the hillside with amazing views or uniquely displayed on the narrow “main” street – a virtual feast for the eyes everywhere you turn! Be careful or could easily spend hundreds of euros on the handmade wood and ceramic items or on the clothes, shoes, and restaurants in abundance throughout this tiny village! Here is Kaitlin buying a hand carved wooden cross from a super friendly Greek craftsman. 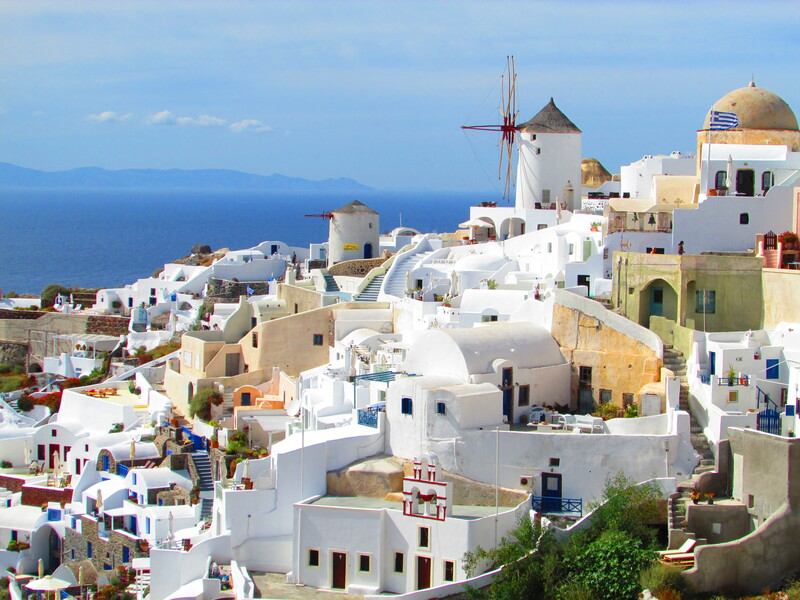 When visiting Oia, take your time and wander through all the quaint streets – up and down and all around! There are so many paths to choose from once you veer off the main street (although the “main” street in itself is tiny and adorable!). Take time to sip a coffee or refreshment, savor a slice of baklava, and let the Greek village vibe into your soul. 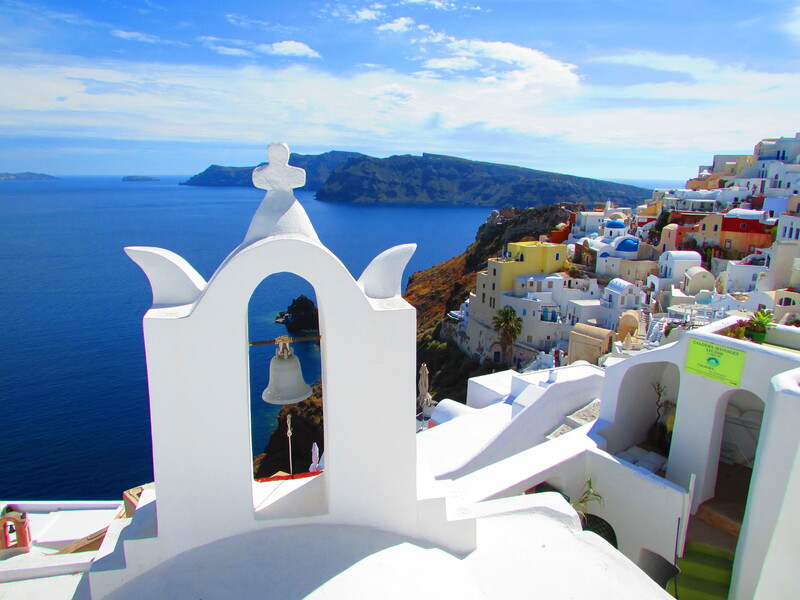 Oia is a very popular tourist destination and many people come for the sunset, but we decided to come early and found the crowds to be less, so we recommend a daytime visit. Although, I have yet to enjoy the famous Oia sunset, so I may change my mind one day! I keep telling my kids how lucky they are to enjoy “school days” like this one – full of adventure, beauty, history, culture, shopping, and delicious food – but it may not truly sink in until they are older and have kids of their own! I know that I am enjoying their amazing worldschooling adventures and hope others will take advantage of the wonderful opportunity to educate our kids anywhere in the world! Just another day at “school”!